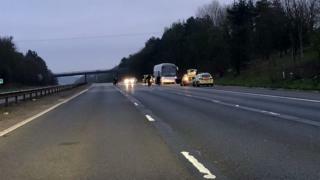 A coach brought a motorway to a standstill after a bomb scare on board. The driver called police after people on board raised concerns about a fellow passenger on the service from Stansted to London. Officers arrived at the scene at about 02:30 GMT and closed part of the M11 in both directions, Essex Police said. They later arrested a 20-year-old man on suspicion of making hoax bomb threats. "We are not treating this as terror-related," the force said. The road, between junction eight for Stansted and junction seven for the A414, reopened just before 06:30 GMT.